Despite all its advantages for customers, online shopping can sometimes be a logistical nightmare — for the merchant. Getting the right items to the right customers in a timely manner with zero mistakes is asking an awful lot from e-commerce. Therefore, you'd expect online-only vendors (i.e., those without brick-and-mortar shops) to have some of the highest merchandise return rates in the industry. But you'd be wrong. According to Internet Retailer, in a poll of 500 companies, online-only merchants had significantly lower merchandise return rates than other retailers. In fact, web-only merchants reported an average return rate of 3.75%, as opposed to the 4.96% average for all 500 companies. This returns statistic matters for online retailers because a merchant's return rate "can indicate problems in website content, customer service, or fulfillment operations." Moreover, "a high merchandise return rate might suggest that product descriptions on the merchant's e-commerce site are not accurate or complete, that call center agents aren't adequately responding to consumer questions, or that warehouse personnel are too often shipping the incorrect product or size." The article further suggests that a product itself can have a significant impact on return rates. For example, the highest merchandise return rates were reported by clothing and shoe companies. After all, even excellent shipping practices, customer service, and web design can't turn a size 2 into a size 10. In a supplemental interview, founder and former CEO of Shoebuy, Scott Savitz pointed out several other factors that can affect a site's merchandise return rate, such as low-quality items and lengthy shipping times. 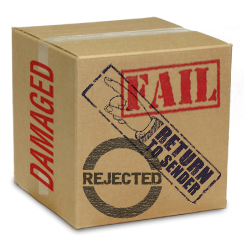 Are Online Returns Just Not Worth the Bother? But we wonder if there isn't another side to this story. Certainly, if an online-only merchant goes above and beyond to provide excellent products shipped in a timely manner, then we'll be less likely to return them. However, returning an item bought online can often involve eating expensive shipping fees, lengthy phone conversations or email exchanges with customer service, and other hassles. So is the lower rate of merchandise returns for online retailers a case of correlation instead of causation? Are you less likely to buy something online if you might have to return it? Or perhaps customers just hang on to the "wrong" item purchased online, rather than deal with the returns process? Sound off in the comments below. Are you less likely to buy something online, rather than in-store, if there's a possibility that you might want to return it? I tend to return more online purchases than instore purchases, but they're usually from stores that have an actual "brick and mortar" storefront, so I tend to return them in person rather than mailing them back. I wonder if that is reflected in the statistics. Absolutely, the hassle of returning an online purchase is a big deterrent for me to return the item. If it's relatively low-priced, there's a good chance I just avoid dealing with it until it's too late. Even if the merchant makes the process as smooth as possible, it's still a pain (gotta find a box that fits, and some packing material, then print out some barcode or packing slip, write some numbers on the box, find my packing tape, print a shipping label, attach it to the box, and then remember to take it to a shipping location). And if there's a return shipping fee, it could easily eat up 30% or more of the would-be refund, in which case it's probably not worth the hassle to me. The possibility of having to return something often makes me hesitate anymore about buying it online, since there is so much Chinese junk out there. And return shipping costs are so high nowadays, many times it is cost-prohibitive to ship something back. I've had this problem with Amazon, when Amazon is not the actual seller but only allowing someone to sell through them. In my case the actual seller was in China and would not do anything about a defective item unless I first shipped it back to China. Amazon is by far the best merchant I have ever dealt with. Shipments are fast and accurate and returns are easy. I do most of my shopping at Amazon. Unless it is significantly cheaper or needed in less than 48 hours, it's Amazon for me. I've returned items to Amazon, even a big screen TV, and it was hassle free. Just left it outside for UPS to come pick it up. Returns were always free. Great thing about Amazon is you don't need to return any grocery items. If there's a problem, they will replace or refund it without having you ship it back to them. Other retailers aren't as hassle free as I often have to arrange the shipping and pay for it. But if I don't like the item, I will return it even at my own expensive. By the time they stopped stringing me along it was too late to file for a credit card charge-back. I strongly recommend that no one use Amazon's return process and instead immediately file with your credit card company if there's a problem. In general, my In-store purchases tend to be more impulsive and less researched than my on-line ones. On line, it's much easier to read reviews, post to forums, look at tech specs, user manuals and compare shop. Better to do your homework to minimize the chance of buying a lemon and having to returning it. Because on-line returns can be a pain. However, service and the ease of returning can be important factors when deciding what store I use. Stores can and do change their return policies over time. I remember when Walmart took returns without receipts. Another example is when Williams Sonoma used to allow returns years after original purchase was made as long as the receipt was in hand. Now they have changed their policies. Returns to Amazon are no hassle at all, easier than drive to the store. You cannot find better customer service than Amazon's. I feel like returns to amazon.com are less of a hassle than returns to a real store. I don't have to leave my house for a UPS pickup!